A fiery coronal mass ejection (CME) took off from the Sun on Jan. 4, 2002. These are the storms that can overpower Earth's protective magnetic field. Solar storms unleashed by the sun's activity may threatenfuture Mars colonies in addition to Earth. Now NASA is investing in aforecasting system that may someday give up to three days advance warning of spaceweather events. Solarstorms become more frequent during the peak activity periods of 11-yearsolar cycles. Earth has some protection because of its magnetic field andatmosphere, but Mars only has a very weak magnetic field and a thin atmospherethat would allow more radiation to reach its surface. "Because Mars does not have the protections thatEarth does, the significance of storms is much greater for a Mars colony,"said Roger Dube, a physicist at the Rochester Institute of Technology in NewYork. Powerfulspace storms can send out a deadly wave of X-rays and high-energy particlesthat could have severe consequences for millions of people on Earth. One such solarflare knocked out the power supply in Quebec and disrupted power andcommunications across North America during a March 1989 solar storm. "It has become more important to have space weatherpredictions because of the impact [the storms] can have on satellites, powergrids, GPS and telecommunications," Dube told SPACE.com. The same threat would exist for any future lunar bases,or a manned human mission on the way to Mars or elsewhere. Building a better solar forecast means more than just launchingadditional sun-watchingsatellites. Dube and his colleagues want to train artificial intelligence (AI)to recognize the crucial signatures that herald an impending solar storm. 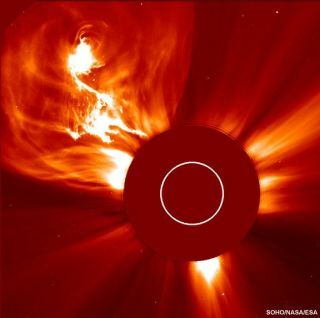 Past efforts have tried to find such solar stormsignatures from data collected by a single spacecraft, Dube said. The new studywill use neural networks to sift through data from all satellites and solarobservatories. "We're developing the AI algorithms to allow them toabsorb not only conventional time-based data, but also to allow the neuralnetworks to absorb and digest image data," Dube explained. Being able to study solar images would allow the AIsoftware to take advantage of hardware such as NASA's Solar DynamicsObservatory, which can observe the sun with 10times better resolution than HD TV. The AI neural network will rely upon a parallelprocessing network with 600 times more computing power than a high-end workcomputer that contains a 3 gigahertz processor. That would allow the AI to quicklycrunch the data coming from the many different sun-watching sources. Sensors or small solar observatories on Mars could alsoadd to the instruments keeping an eye on the sun. But Mars colonists would alsoneed a system that could alert them to seek shelter from any incoming solarstorm, because such storms don't have audible or visual cues for peopleexperiencing them. A second stage of NASA's new effort involves developing anall-clear sensor which can gauge how a storm is progressing on the ground, andthen signal whenever the storm has finally died down. "We'll have to test it on the space station, perhapson the moon at some point if there's a mission, and finally place it with a colonyon Mars," Dube said. Sensors might also protect space travelers on their wayto Mars or other destinations throughout the solar system. An alert would cueastronauts to find shelter inside a shielded safe room aboard the spacecraftuntil the danger had passed. The most reliable predictions for dangerous space weathercurrently come from an ESA/NASA mission at the L1 Lagrange point ? one ofseveral locations where the gravitational forces of the sun and Earth perfectlybalance out the orbital motion of a spacecraft. The SOHO spacecraft and other solar satellites act almostlike buoys that transmit half an hour advance warning to Earth when they detecta monsterwave" from a solar storm, Dube said. NASA and the National Oceanic and Atmospheric Administrationthen send out advance alerts to commercial airlines, power companies orsatellite operators, based on the heads-up from the thin line of sun sentinels. Still, boosting forecasting power to three days couldprevent close calls and ensure better preparations on the ground. After all, halfan hour doesn't necessarily represent much time for humans to respond. "You don't know when the storm is going tohit," Dube said. "It might hit at 2 a.m. on a Sunday."